As promised a new painting. This painting is the final result of the process that began with the watercolor sketch of Sandlake. Acrylic on Canvas, 20" x 30"
In the distance you can see Cape Lookout. Beneath the cape, lies the trees of the Sandlake Recreation area, while on the left you see some of the trees on Whalen Island. The trees in the foreground are mostly dead, having been killed by a combination of salt water intrusion and some kind of creeping vine (which you can see all over the dead trunks). The painting itself is much more vibrant has a greater value range than this photo indicates. I was disappointed that I was unable to get a good image of this art work but I've had that trouble often in the past. At this time, this painting is available for offers. Contact me if you are interested. 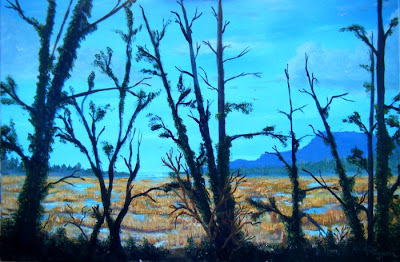 I'm reading: Sand Lake, Oregon (Acrylic Painting)Tweet this! Once I'm less broke you might find yourself having a new obsessive buyer. As to the comment you left, which actually made me laugh enough to make my chest hurt, that was what I looked like after having worn a seatbelt in my car accident. I don't even want know what I would have looked like if I hadn't.